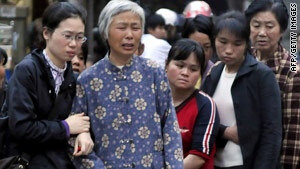 Relatives grieve outside a Chinese elementary school where a man stabbed eight children to death on Tuesday. Beijing, China (CNN) -- A man stabbed eight children to death and wounded five others at an elementary school in eastern China on Tuesday, local media said. The attack took place shortly after 7 a.m. at the Experimental School in Nanping City, the state-run Xinhua news agency said. The city, in Fujian province, is 1,486 kilometers (923 miles) from the nation's capital, Beijing. The school, with more than 2,000 students, is considered one of the best in the city of 3 million people. The suspect in the attack is a 41-year-old man who once worked as a doctor at a community clinic. Some news reports said he recently resigned from the position; other said he had been fired.